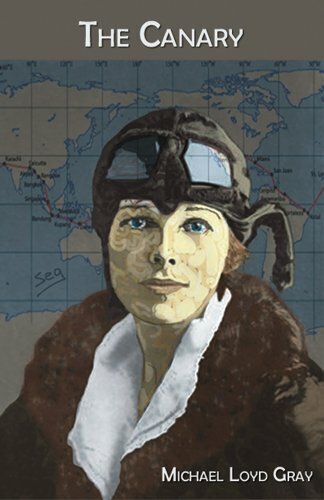 Canary is a novel purporting to reflect on the final days of Amelia Earhart. The author employs two narrative voices: one stream of consciousness, exploring the thoughts of the stranded and dying Amelia on Gardner Island; and the other a first person narrative of the much younger Amelia as a youth in Chicago. Two problems present themselves from the very beginning. First, there is no definitive proof that Earhart landed on Gardner Island. Second, the Chicago narrative focuses almost entirely on a relationship between the young Amelia and a young Ernest Hemingway—a relationship for which there is absolutely no historical proof. That the book is presented as having a grounding in history is a puzzle since little is grounded in historical research or reality. To claim that there is a kind of imaginative exploration taking place is also less than accurate since there is hardly any real flight of imagination here; much of the material is deadeningly repetitive. Let's start with the first person narrative of the young Amelia, who is imagined to meet the young Hemingway. For what purpose is this relationship manufactured? Largely, it seems, so that they can eat together: chipped beef on toast and mashed potatoes (p. 23); ham and potatoes and blueberry pie (p. 41); lemonade, ham and cheese sandwiches, potato salad and apple pie (p.52); roast beef sandwiches and milk (p. 68); pancakes with maple syrup and toast with butter and jam (p. 86). You get the picture. And lest you think any interesting action or conversation takes place during all this eating, you will be disappointed. The dialogue between these two fictitious versions of historical characters reads like some of the material submitted to those "Bad Hemingway" contests. The faux Hemingway tells the faux Amelia about his family's summer home: "Our cottage is called Windemere. We have a long rickety dock and a strip of beach shaded by cedars and birches. And there are Indians and endless forests and the fishing is the best. We eat trout cooked over campfires." "And so how is school, Hem?" "It's school, Hem. Something to finish and then move on. After the coming winter, it will be almost done." "Shall we go back to the diner on Michigan?" I ask. "Let's find another joint. And be adventurous." "You be the guide, Hem." "Do you like spaghetti?" he asks. "I do. Where shall we go?" "I know a swell Italian place on State Street." "On your way home, practically. Are you tired?" "Not at all. Walking is so bracing." "It makes me hungry," he says. To use two historical figures without any real purpose is to exploit their names for no good reason, and to manipulate the readers' interest. And for heaven's sake—why mimic Hemingway-esque speech in such a maddening way? Was this meant to be funny? It felt self-indulgent and dishonest. So this leaves us with the stream of consciousness narrative of the older, dying Amelia, crashed and stranded on the island. What do we learn of this Amelia in these last days? Do we ride this stream of consciousness into the deeper recesses of her mind, her personality? What are her concerns? Her obsessions? Do they provide a powerful narrative? You be the judge. Her primary obsessions are with water and crabs, about which she thinks over and over and over again. Thank God some water had collected in shells. Water is an issue again. Last night I had some from open shells.
. . . finally I find some water in a tree crook. Of course there is some connection between her endless faux memories of faux eating with faux Ernest, since faux Amelia is slowly dying of hunger and thirst in this faux version of her crash site. But I'm so numbed by boredom and frustration with this book that I simply don't care. I find myself wanting her to die and get it over with, just so I can be put out of my own misery. Oh. And then, there are the crabs. On this faux island there are, apparently, killer crabs. Crabs which swarm in groups the size of armies and send attack squads to tear the flesh of the sleeping faux Amelia whenever she dozes from her endless obsessions about water, and memories of the faux Ernest. Last night an attack in some force.
. . . While I slept a dozen made the rush. But as I luxuriated in the daydream, the attack was launched. Several crabs rushed from cover and bloodied me. I woke with a shrill yelp. Several crabs caught me napping. Bloodied my leg. . . . These two scurried far ahead of the squadron. Again, and again, and again. There is no indication in this text that Mr. Gray is referring to anything other than the typical crab—no description of Crabs of Unusual Size (or of the Cliffs of Insanity, for that matter). So I did some research. There are enormous crabs called Coconut crabs, who are the largest living anthropods, living in many of the Indo-Pacific islands. There are even some theories that, if Earhart crashed on one of these islands, she could have been overcome by these crabs. If this was Mr. Gray's intention, why would there be absolutely no reference to enormous crabs, the likes of which Amelia's never seen? Why wouldn't he have provided narrative that painted a picture of much more frightening creatures? The narrative talks about Amelia killing these crabs with a rock. If she were meant to be battling coconut crabs, that would be a highly improbable way of overcoming them. Once again there is a failure to ground the narrative with enough fact to make it comprehensible. It has to be clear by now that Canary fails in both the stream of consciousness voice and in the more "historical" first person voice. The overarching problem is the lack of research, the overly imaginary scenarios in both voices, and the repetitive writing. In both voices, the novel fails to develop or deepen. I think the reason is that the author didn't have enough to say. My sense is that he had a kind of "notion" that he wanted to play around with, but that it really didn't give birth to material of quality. It certainly doesn't offer enough to sustain a reader's attention. Mr. Gray has won awards for other projects: in 2005, the Alligator Juniper Fiction Prize and The Writers Place Award for Fiction. The 2008 Sol Books Prose Series Prize. He was awarded the Elizabeth George Foundation grant. Explore Mr. Gray's earlier works since this one is clearly not one of his strongest. Debra Leigh Scott is Founding Director of Hidden River Arts, and Editor-in-Chief of Hidden River Publishing. She is the author of Other Likely Stories.